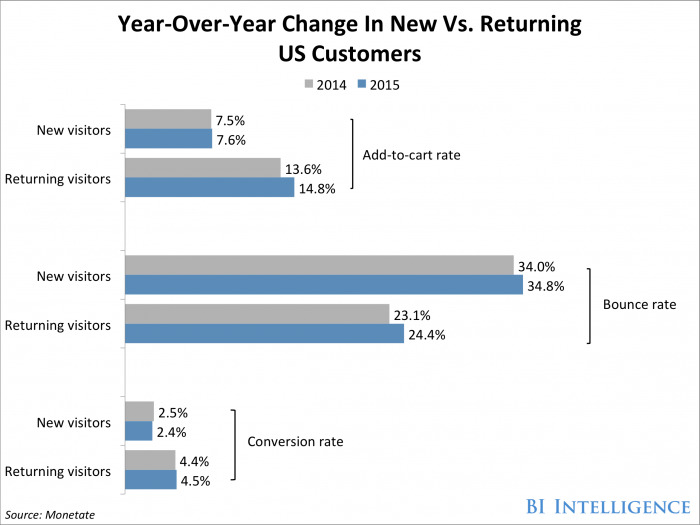 New customers are certainly important to retailers, but returning customers should mean more. A new report from Monetate reveals that the value of returning customers is greater across numerous product categories, and that value continues to grow every year. Returning visitor transactions comprised 48% of all U.S. e-commerce sessions in the fourth quarter of 2015 and spent $2.7 billion, almost double what new shoppers spent in that time period. New online shoppers are only half as likely as returning customers to place an item in their card at just a 7.6% rate, compared to 14.8% to existing shoppers (up from 13.6% in the same period one year earlier). New visitors also have higher bounce rates, the act of leaving after visiting just one page (typically the homepage). Those shoppers leave 34.8% of the time compared to 24.4% for returning shoppers, though that number is up from 23.1% in the year-ago period. Returning visitors also have a higher conversion rate at 4.5%, up slightly from 4.4% in Q4 2014. New visitors convert just 2.4% of the time, down from 2.5% in the year-ago quarter. So returning customers are clearly important, but longevity is also crucial. The top quartile of worldwide e-commerce companies receive most of their revenue from repeat customers at the two-year mark, notes RJ Metrics. At three years, repeat customers represent more than 60% of revenues for those companies. Online retailers, therefore, need to know who their customers are in order to hold onto them and reach those two-year and three-year milestones. And there are numerous ways to do that. Cooper Smith, senior research analyst at BI Intelligence, Business Insider's premium research service, has compiled a detailed report on e-commerce demographics that breaks down U.S. online and mobile shoppers by gender, age, income, and education, and takes a look at what they're shopping for, and how their behaviors differ.